It is an easy and pleasurable task to create a garden for butterflies. Planning a habitat especially to attract these beautiful, ephemeral creatures allows the gardener to appreciate their intricate wing patterns up close as well as to play a conservation role in the home garden's environment. The presence of butterflies flitting and frolicking in carefree flight is a sign that your garden is a healthy, well-integrated horticultural habitat. Begin by providing the adults with their favorite flowers for nectar and the plants on which to lay their eggs (host plants). Adult butterflies seek nectar from flowers for nourishment and as fuel for flying. As they sip from the heart of a flower, grains of pollen gather on their bodies, which helps pollinate the garden as they flutter from blossom to blossom. Flowers advertise their unique personal attributes of color, scent, and shape to lure butterflies to visit them, thus ensuring development of their seeds. Different butterflies have different preferences for their nectar and host food plants. Below you'll find lists to get you started. A successfully designed butterfly habitat includes food for both the adult and its caterpillars, water, shelter, and warmth. Like most insects, butterflies are nearsighted, so big groups of the same flower are easier to see than isolated flowers scattered here and there. On sunny days, a garden is lively with butterflies. Being cold-blooded, they like to bask in the sun and warm their wing muscles so they can go about their job of nectaring. Locate your butterfly garden in a warm, sunny area; and, for protection from wind on gusty summer days, have tall flowering plants at the back of the border. Butterflies also like puddles of water. A shallow water element, such as a bird bath, decorative stone water container, or small water garden set in the ground, will serve their needs and add interest to the garden. Gardens that welcome butterflies also provide a haven for other insects -- some welcome, others not so much. Butterfly larvae's chewing mouth parts do damage leaves, but without those ugly duckling caterpillars you won't have the colorful flying adults they become. Other insects in your garden are diet staples for many birds and their babies, such as robins, wrens, swallows, and bluebirds. A butterfly garden does require that you choose your pest control regimen with care. It may take a few years, but a landscape that contains a wide variety of plants and is kept free of chemical pesticides will eventually provide its own pest control. Birds and beneficial insects keep the populations of most unwelcome insects in check -- not eradicated, but in balance. A simple soap spray is an effective treatment for aphids -- it blocks breathing pores on the exterior of their bodies. Mix 1-2 teaspoons of liquid dish soap with water in a quart spray bottle and then apply that to the aphids. Most garden centers also offer insecticidal soap pre-mixed in ready-to-use spray bottles. Japanese beetles can be a scourge on some plants, but a combination of strategies will reduce their impact. Visit the garden daily to pick off the beetles and put them in a can of soapy water. The beetles may try to drop to the ground if disturbed, rather than fly away, so if you position the can under the beetles, they may fall into the drink on their own. Monterey Insect Spray can be effective against Japanese beetles. Beneficial nematodes applied to the soil will destroy young beetle grubs that feed on grass roots. We find many of our customers prefer living with a few chewed leaves to engaging in endless garden chemical warfare. A garden is, after all, a refuge, not a battlefield, and eliminating pesticides in the water that runs off our land is an added benefit. 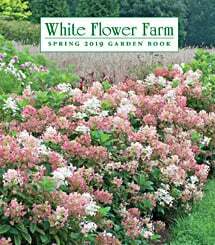 We offer some of these plants in our spring or fall catalogs. Please check our Web site for availability. We offer some of these plants from time to time. Please check our Web site for availability.